Guill Tool introduces the NEW 500 Series crosshead with MAGS gum space adjustment. The 500 Series is designed specifically for the flow characteristics and unique processing challenges of elastomeric compounds. One of the key features engineered by Guill on this new crosshead design is the mechanically assisted gum space (MAGS) adjustment system. This new method of gum space adjustment allows the operator to make an effortless adjustment from a single point using a common socket wrench. No more need to struggle with multiple nuts and bolts in order to adjust gum space, which leads to faster adjustments. The visual indicator on the core tube allows the operator to see how far the gum space has been moved, making those adjustments much more accurate and repeatable. The hardware-free and patented cam lock design of the NEW 500 Series from Guill means no time is wasted unbolting and re-securing fasteners for disassembly and re-assembly. Only half of a rotation of the cam nut is required to loosen and automatically extract the deflector from the head body, which is another time saver. Also, with no undercuts on the deflector, there are no material hang-ups when extracting the deflector, allowing for faster and easier cleaning and changeover. The NEW 500 Series also features the latest Center-Stage concentricity adjustment system that significantly reduces pressure on the tooling, allowing easier and more precise concentricity adjustments without loosening the face bolts. Easy-Out inserts for the adjusting bolts also allow simple replacement of locked or damaged adjusting bolts, which further saves on repair and downtime. Another innovative feature of this new rubber/silicone crosshead is a cast aluminum liquid-fed cooling sleeve that allows the user to switch out the cooling jacket in the event of a line obstruction, again reducing downtime compared to traditional integrated cooling systems. 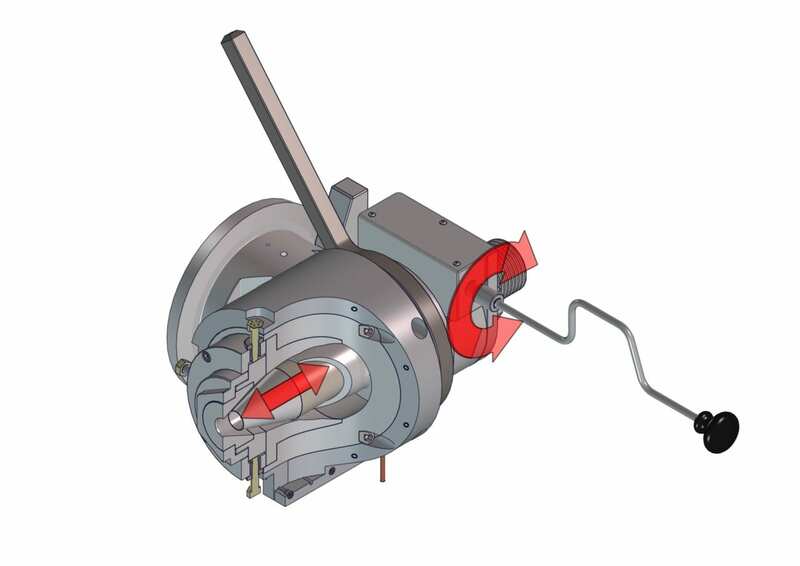 The NEW 500 Series crosshead with MAGS gum space adjustment is a drop-in replacement on most existing NRM lines, however this crosshead design can also be adapted to fit any extruder design or line layout. The addition of a newly designed flow inlet channel reduces the shear and heat that is generated as the materials are being processed. This leads to lower head pressures allowing the material to move through the head in a much more balanced and even flow. All crossheads supplied by Guill are furnished with a tool kit for assembly and disassembly as well as a detailed operator’s instruction manual. The engineering team at Guill will gladly assist users in the implementation and operation of the NEW 500 series crosshead.